How can you create 14,560 unique designs from a few dozen components? Modular Design! Creating your ideal fixture is easier, faster, and more cost effective with modular design. There are many manufacturers that allow for some level of modular design, but no one does it quite like Auberge Lighting! There's so much to love when it comes Auberge Lighting and their sister company ALVA. Let's start with the resin shade. Built for durability, Alva's vandal resistance, architectural shades perfectly withstand being struck by a bowling ball test! These fixtures are designed for the rigors of heavy traffic and frequent cleaning making them perfect for hotels, multifamily residential, hospitals, medical facilities and commercial settings. Owners are pleased to learn that these shades are environmentally friendly. They feature translucent resin with embedded fabric and natural materials; they're 100% recyclable and made of 40% post consumer recycled content. 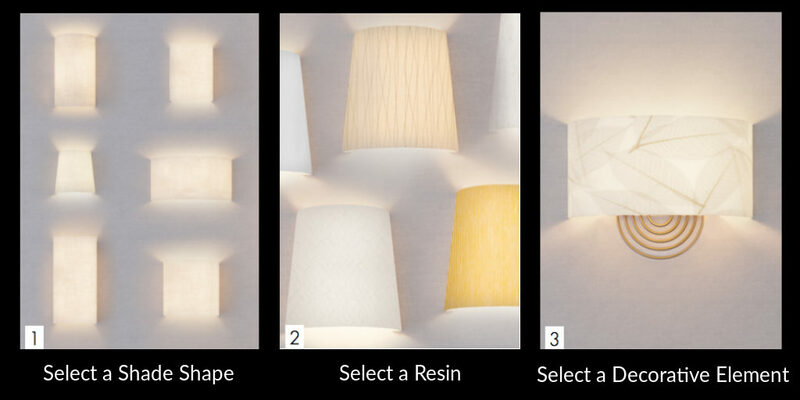 Designing a hotel and want to incorporate room numbers in your lighting fixture? Great idea! There's no better way to clean up the look of hallways than to specify fixtures that perform multiple tasks. What about adding decorative components to compliment your carpets and wall coloring. It's easy with Auberge. Auberge uses ALVA shades and focuses on quality decorative components that compliment the shades. The difference is how you customize the fixtures. There are just three basic steps. Select a pattern from Alva's vandal resistant, architectural resins. Need to see resin samples or decorative elements first hand? If you're a designer, architect or engineer in the Hampton Roads or Williamsburg area, contact us for a showing.